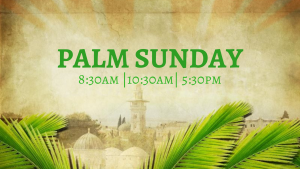 Palm Sunday is the final Sunday of Lent, the beginning of Holy Week, and commemorates the triumphant arrival of Christ in Jerusalem, days before he was crucified. Join us for Mass this Sunday at Holy Trinity! We will be celebrating Mass at 8:30am, 10:30am, and 5:30pm.